A lone hero police officer shot dead four terrorists armed with machetes and guns in the second Spain attack. Five suspects, wearing what appeared to be explosive suicide vests, attempted to drive a van onto a pedestrian area in Cambrils, a coastal town around 60 miles from the Spanish city. Seven people were injured in the attack in the earlier hours of this morning, one of whom later died. The fresh terror unfolded at around 1.30am on Friday, barely nine hours after van rampage left 13 dead and more than 100 injured in the centre of Barcelona. 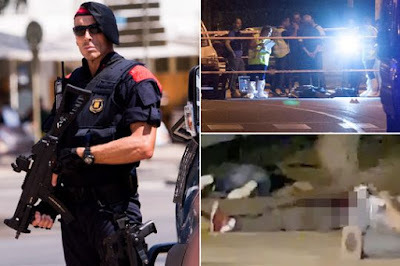 Joseph Lluis Trapero, the head of the regional police force the Mossos d’Esquadra, said the initial attack was designed “to kill as many people as possible”.